I took about 4 hours last night to finish up Ultima 4. I wasn’t intending to play that long but if I get that near the end of a game I just have to finish it. Getting the remaining stones wasn’t a big problem and I just made my way via Hytholth to the three altar rooms, used the stones on the altars and got the three part key. Something I had forgotten was that I still needed the skull of mondain and the candle of love to get into the abyss. The skull was easy enough, getting the candle means going to Cove. 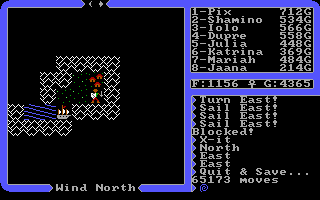 To get there I had to sail through the whirlpool that moves around the oceans in the same manner as getting to Ambrosia in Ultima 3. The problem here was finding it, you realise how big the world is when you are sailing around trying to find a randomly moving tile. I got there eventually at any rate got the candle and set sail for the abyss. To get to the Stygian abyss, you have to sail through a swarm of pirate ships. This is a bit tricky as they have a habit of blasting out my ship but I made it in the end. Once through, I stand in the middle of a volcanoe, use the bell, book, candle and skull and enter the abyss. I said yesterday that the dungeons in this game were easy. The Stygian abyss pretty much makes up for this with an excess of predesigned rooms many of which contain little tricks. Often these rooms link together and you can go round in circles until you find the way to open secret passages. At the end of each level is an altar, where I have to use the appropriate stone to create a ladder down to the next level. One of the worst rooms was full of reapers, who put my party to sleep all the time. Getting through here is more a test of patience than anything. Another room right at the end has me facing a mirror image of my own party, but this turns out to be one of the easiest in the abyss. Battling through the abyss is fairly epic in general and took some serious time. I finally made it down to the last altar, entered the room with the codex using the three part key and started the endgame. This is pretty much a quiz on the virtues. Having played this far its easy enough, the final question perhaps being the only tricky bit. The visions from the virtues give you the answer if you noted them down but the answer is guessable as infinity anyway. Once done I get to see the codex and am sent back to earth to serve as an example to all. Its a satisfying ending to a really epic game. I’m surprised at how long its taken to play through, but I’ve enjoyed pretty much all of it with the exception of hunting down that whirlpool. The idea of not having a bad guy to kill at the end was pretty revolutionary, in terms of gameplay there wasn’t that much new from Ultima 3 apart from conversation and dungeon rooms. All in all, I’d say the game was big enough but I seem to recall Ultima 5 being much larger still.